Although being a Tolkien fan, I found The Hobbit a bit of a tedious read. I’m looking forward to the movie(s). The effort that was given to the building his fantasy world, even down to inventing languages, however, is very fascinating. The article below from the Oxford University Press blog exemplifies this. It will be interesting to see how much of J.R.R. Tolkien’s several invented languages will appear in Peter Jackson’s The Hobbit. In a letter to his American publisher, dated 30 June 1955, Tolkien suspected there were limits to how much invented language readers would ‘stomach’ — to use his term. There are certainly limits to how much can be included in a film. American audiences, anyway, are subtitle averse. Of Tolkien’s invented languages, Elvish receives most attention, not unreasonably, since it is illustrated most often in Tolkien’s works and most fully articulated in his manuscripts. Other languages are essential to The Lord of the Rings, however. When Gandalf reads out the delicately curved Elvish script on the One Ring in the rough-hewn Black Tongue of Mordor it represents so incongruously, Tolkien proves that some language — just the sound of it — can petrify us as surely as any Ringwraith. Tolkien’s languages aren’t suitable only for poetry or gnomic verses on rings. They also include the element of language most familiar to speakers speaking to one another every day, namely, names. 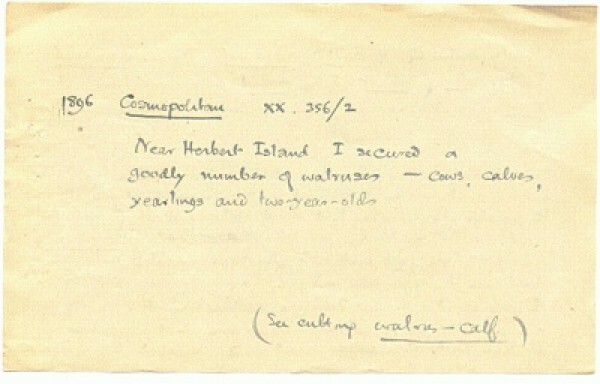 A slip written by J.R.R. Tolkien on the etymology of “walrus” during his years working for the Oxford English Dictionary. Image courtesy the Oxford University Press Archives. Tolkien was always a philologist, whether in scholarship or fiction. He treated his fictional languages as though they were real, as though he were discovering rather than inventing them. In his scholarship, reconstruction of the sound system or grammar of languages like Old English and Old Norse was routine. For instance, he wrote ‘Appendix I: The Name “Nodens”’, in the Report on the Excavation of the Prehistoric, Roman, and Post-Roman Sites in Lydney Park, Gloucestershire, published by the Research Committee of the Society of Antiquaries of London (1932). So, it isn’t in every library, but it has been helpfully reprinted in Volume 4 of the annual journal Tolkien Studies (2007). In it, you will find passages like this one: “Although it is perhaps vain to try and disentangle from the things told of Nuada any of the features of Nodens of the Silures in Gloucestershire, it is at least highly probably that the two were originally the same. This is borne out by the isolation of the name in Keltic [sic] material, the importance of Nuada (and of Nodens), and not least by the exact phonological equation of Nōdont- with later Nuadat.” This reads very much like a passage from one or another appendix to The Lord of the Rings, and if you read it without knowing it deals with a matter of linguistic and historical fact, you might well think it was fiction. How to Name a BagginsMany names in Tolkien’s fiction are not invented, or, at least, not invented by him. Nearly all of the names of dwarfs in The Hobbit can be found in Dvergatal or ‘Tally of the Dwarfs’ in the Old Norse poetic Edda, as can the Old Norse precursors of Gandalf and Thorin’s nickname, Oakenshield. Hobbit names are an interesting blend of borrowed and invented items. For instance, a few males of the Baggins family of Hobbits sometimes bear real — though indisputably outmoded — personal names, such as Drogo (name popular among the French nobility c1000 CE, but since, not so much), Dudo (name of a tenth-century Norman historian and ecclesiast), and Otho (name of a Roman emperor). Other masculine names are converted from surnames or words found in natural languages, such as Balbo, Bingo, Fosco, Largo, Longo, Minto, Polo, and Ponto. But still others appear to be well and truly invented by Tolkien, such as Bilbo, Bungo, and Frodo. Perhaps they were invented to sound and look like the borrowed and converted names, but more likely those were found to fit patterns implied by the invented ones. 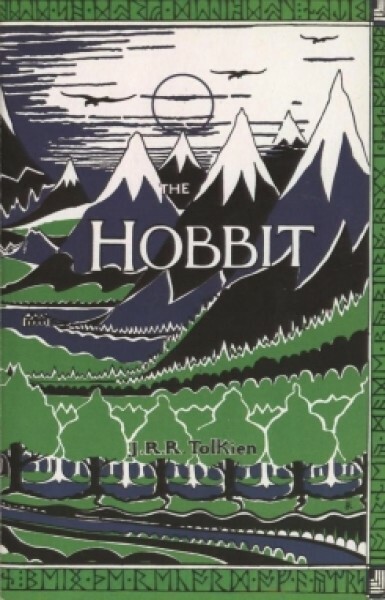 The 1937 Allen & Unwin hardback edition cover designed by Tolkien. Many female Bagginses were given English flower names, such as Daisy, Lily, Myrtle, Pansy, Peony, and Poppy. Others had personal names common in English and other natural languages, for instance, Angelica, Dora, Linda, and Rosa. And a few bore personal names converted from surnames, like Belba, or historical but unfamiliar personal names, like Prisca (name of a Roman empress). The repurposing of such names and words as names of Hobbits may be inventive yet not count as an invention. Yet the invention is not of the names themselves — not most of them, anyway — but of linguistic relations among the names and social relations, embedded in the linguistics, among those to whom they belong. The names have no actual relation to one another. They are borrowed from Italian and Scots and Norman French, or in those few cases made up. Tolkien brought them into relation by means of their sound shapes: the masculine names, whatever the source, and for whatever genuine etymological reason, are all two syllables and end in –o, which is proposed as a mark of the masculine name in the naming practices of Bagginses. For female Bagginses, the flower names are a fashion that obscures the way gender is marked in Baggins names: Belba, Dora, Linda, Prisca, and Rosa are marked with the contrasting feminine –a. Among all of the flower names, the –a names suggest a diminishing but tenacious historical tendency. But all language changes, as do naming practices, and any reconstruction of personal names in a historical language must account for remnant forms, anomalies, and generational trends. There and Back AgainOther Hobbit clans have different types of names from those of the Bagginses. Brandybuck names have a distinctly Celtic shape, given the profuse –doc suffix: Gormadoc, Marmadoc, Saradoc, and, of course, Meriadoc. The Tooks prefer names from medieval romance and beast epic: Adelard, Ferumbras, Flambard, Fortinbras (rather than Armstrong, which has a quite different shape), Isengrim, and Sigismund, for instance. The Longfathers have names constructed from Anglo-Saxon elements: Hamfast and Samwise, in which –wise may mean, as it sometimes does in Anglo-Saxon, ‘sprout, stalk’. Over the generations, clan marries into clan, and the names mingle and develop new patterns: the names are the genealogical architecture of a culture. Through alliances and friendships, Hobbit culture reticulates into the wider web of cultural relationships across Middle Earth and deep into the mythology of which the story of Middle Earth is only a part. The linguistic bases for cultural relationship and contrast are woven tightly and everywhere into the fabric of Tolkien’s fiction. In the middle of the mythological pattern, Tolkien has pricked in the –o and the –a, suffixes that say something about who the Bagginses are, or who they think they are, something that allows one Baggins to find the Ring and another to destroy it, just in time. Michael Adams teaches English language and literature at Indiana University. In addition to editing and contributing to numerous linguistic journals, he is the author of Slang: The People’s Poetry and Slayer Slang: A Buffy the Vampire Slayer Lexicon, and he is the editor of From Elvish to Klingon: Exploring Invented Languages. Subscribe to only lexicography and language articles on the OUPblog via email or RSS. The post The Naming of Hobbits appeared first on OUPblog. ‹ PreviousDoes a nation need a standing army?